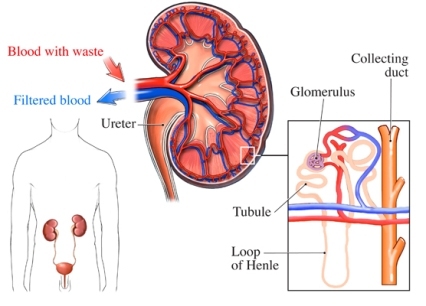 IgA nephropathy is a kidney disease. It may start with minor changes in the kidneys, but it can lead to more serious problems such as kidney failure . A buildup of a protein called IgA causes IgA nephropathy. These proteins help the body fight infections. Their numbers go up when you get sick. The protein buildup can hurt the tiny tubules of the kidneys. The tubules filter the blood and make urine. Protein buildup makes it harder for the kidneys to work the right way. This causes blood and proteins to leak into the urine. Your genes may play a role in the buildup of IgA proteins. Symptoms are not present in the early stages of the disease. Blood in the urine is often the first sign. It usually happens after an infection such as a cold. Only a test can find small amounts of blood. Larger amounts of blood will turn urine the color of pink or cola. The goal of care is to slow the progress of IgA nephropathy and limit kidney damage. You will need to treat other health problems that cause stress on your kidneys such as high blood pressure . Your doctor may advise taking dietary supplements such as fish oil. Don’t start taking them on your own. They can interfere with other medicines you take. Daily exercise will help you feel better. It can also help with controlling blood pressure and cholesterol. If you smoke , talk to your doctor about how you can learn to quit. Tell your doctor if you have a family history of IgA nephropathy. You and your doctor can watch for signs of the disease and manage issues like high blood pressure and cholesterol. IgA nephropathy. EBSCO DynaMed Plus website. Available at: http://www.dynamed.com/topics/dmp~AN~T114248/IgA-nephropathy . Updated January 11, 2018. Accessed June 5, 2018. IgA nephropathy. National Institute of Diabetes and Digestive and Kidney Diseases website. Available at: https://www.niddk.nih.gov/health-information/kidney-disease/iga-nephropathy. Updated November 2015. Accessed June 5, 2018. IgA nephropathy. National Kidney Foundation website. Available at: https://www.kidney.org/atoz/content/iganeph. Accessed June 5, 2018. Immunoglobulin A nephropathy. Merck Manual Professional Version website. Available at: https://www.merckmanuals.com/professional/genitourinary-disorders/glomerular-disorders/immunoglobulin-a-nephropathy. Updated January 2018. Accessed June 5, 2018.